If you know me, you know I’m all about spontaneity and will always say yes to a last minute weekend adventure! 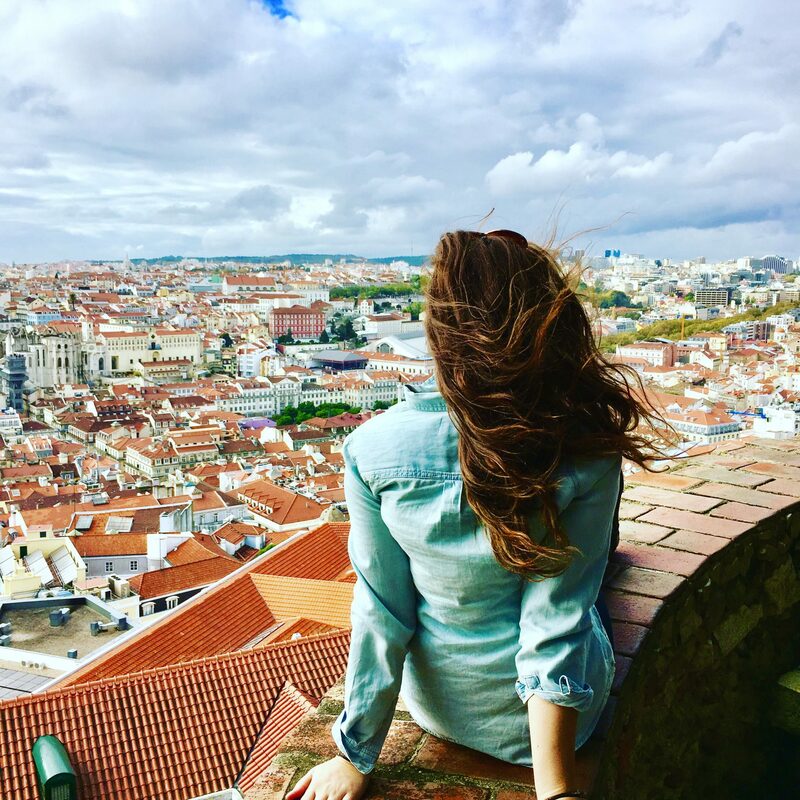 I’ve traveled to so many beautiful countries over the years, that I felt it was time to explore my own. After this whirlwind of a weekend, my consensus is that the USA is underrated which brings me to my first USA blog post! As the title hints, my best friend and I road tripped from Vegas to Phoenix in 48 hours! We did 12.5 hours of driving across 3 states, put 676 miles on our rental car, took 573 photos, and made so many memories along the way! You could easily spend weeks exploring the Grand Canyon and its surroundings but unfortunately we only had 48 hours, although you better believe we made the most of it! Read on for my Ultimate Grand Canyon Road Trip Itinerary! It’s a 4.5 hour drive to Page, AZ, the first stop on our road trip. Therefore, we decided to put a few hours of driving in during the night to break up the drive and started the road trip right from the Vegas airport! St George, Utah was the perfect halfway point, about 2 hours away, with affordable roadside hotels to get in a few hours of sleep. Now, if you have more than 48 hours, consider spending the night in Vegas and hitting up the strip! Zion National Park is right by St. George, so once you’ve recovered from your Vegas hangover, I recommend spending a day exploring Zion before continuing with our itinerary. If you spent the night in St George, Utah like we did, you’re about 2.5 hours from Page, AZ, the first stop. The highlight of the day was touring the Antelope Canyon (more on this later), however it requires an advanced reservation. My recommendation is to make the reservation for noon, that way you’ll have plenty of time to drive to Page and explore the area a bit before the tour. Glen Canyon National Recreation Area is worth a stop and a great pre-cursor to the Grand Canyon! You’ll see scenic drive signs and marked look out points where you can pull over and explore. Nearby is also the US’s second largest man made lake, Lake Powell. This blue beauty amist the sandstone was created from Glen Canyon’s dam holding back water from the Colorado River. Next up is the magical Antelope Canyon, which is actually two canyons, the upper and lower. Both are formed from flash floods eroding the bright orange Navajo sandstone. The Lower Canyon, as the name alludes, is below the ground where the Upper Canyon is at ground level. Located a few miles apart from each other, both canyons are located on Navajo lands and therefore the only way to visit them is with an authentic Navajo tour guide. You’ll have to pay a one time $8 permit fee to enter the Navajo land in addition to the cost of the tours. Now here’s the hard part, choosing which canyon to visit, (although if you have the time obviously I would say to visit both!) We did a lot of research and found that the Upper Canyon is the most popular, slightly more expensive, and way more crowded. Some may even argue that it is the most beautiful, as the most expensive photograph in the world was taken in this canyon by Peter Lik and sold for $6.5 million! Despite this, we chose to visit the Lower Antelope Canyon as the idea of descending underground and entering a maze of twisting and turning paths sounded magical, and let me tell you, it was! We booked with Ken’s Tours- they run every half hour on the hour and last a little over an hour. One of the coolest parts was climbing the stairs down into the canyon and then climbing back up and realizing that you were underground! Looking at the vast land you would have never guessed there was a whole world beneath you. More tips for visiting the Antelope Canyon here! Have you ever looked up at clouds and recognized different objects? That’s what the canyon was like! With every turn we would see a bear, an eagle, a lady in the wind, a Navajo Chief. If you have an imagination, then this is the place for you! I recommend being at the front of your tour group if possible, that way nobody will be in your way for taking photos. After the tour, there are a lot of spots in downtown Page that you can grab lunch before heading to the next stop of the road trip, Horseshoe Bend. It’s only a ten minute drive between Antelope Canyon and Horseshoe Bend though, so don’t get too comfortable! One of the great things about this spot is that people of all ages and abilities can enjoy it, as it’s a short easy hike from the parking lot to the attraction, (and it’s free!). I don’t want to spoil the view, but be prepared for some amazing photo opps overlooking the Colorado River 1,100 feet below! I’d recommend budgeting an hour or so at Horseshoe Bend before continuing on your Grand Canyon road trip. If you’re on the road by 3:00, you should be able to make it to the Grand Canyon just in time for the sunset! It costs $30 per car to enter Grand Canyon National Park, but that entrance fee is good for 7 days so you can come and go as you please. Once you enter the park, the first lookout point you’ll come to is called Desert View. This spot also happens to be the number one spot to watch the sunset. If you followed my itinerary up to this point, you should be arriving at the Grand Canyon just in time! There are a handful of lodging options inside the National Park itself in an area called Grand Canyon Village. My recommendation is to stay at the Bright Angel Lodge. This place was an unexpected treasure as it was located right on the edge of the Grand Canyon offering spectacular views within steps of our front door. The main lodge building also has a bar, a restaurant, and a cozy fireplace inside; and what better way to end the evening than with a glass of wine and a view! Sunday Funday: Morning Grand Canyon Hike, Lunch in Flagstaff, Scenic Drive through Sedona’s Red Rocks, and an Afternoon Hike to Devil’s Bridge. Wake up, you’re at the Grand Canyon! The Bright Angel Lodge restaurant offers an affordable full breakfast (with a view! ), and it is important to fuel up before your morning hike. 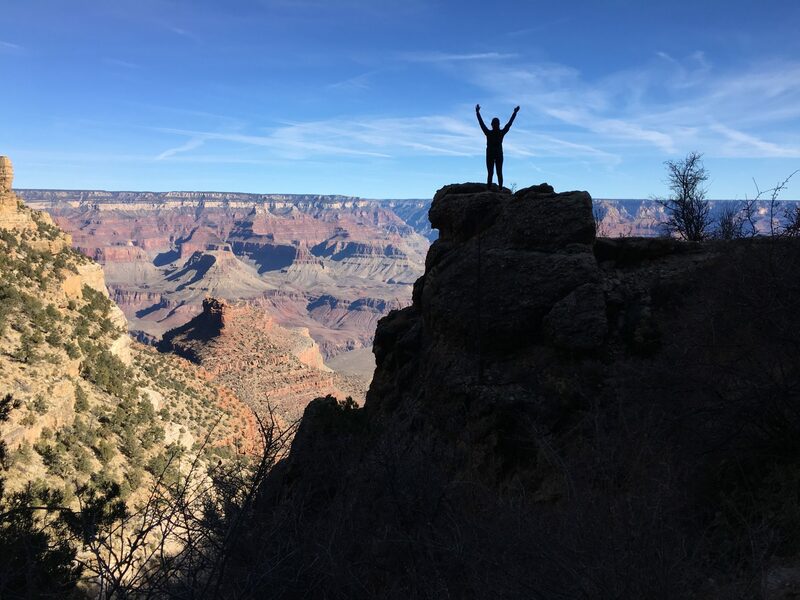 Now there are MANY Grand Canyon hikes that you can do of variable difficultly and lengths, but the important thing to remember is that the farther you go down, the longer you have to hike up! We chose to hike the Bright Angel Trail, one of the most popular trails of the South Rim. The full trail is 12 miles, but it is important to know that you should NOT hike from the rim to the river and back in the same day. If you do choose to hike to the very bottom of the canyon, plan to camp there for the night before hiking back up the next day. The Bright Angel Trail is well marked and there are switch back points at 1.5, 2, 3, 4.5, and 6 miles. In the interest of time, we hiked down to the 1.5 mile marker, and surprisingly the hike back up felt shorter than the way down. I think this was because we stopped nearly 100 times on the way down for pictures, and rightfully so! The Grand Canyon is one of the most picturesque places I have ever seen. After your Grand Canyon hike, it’s time to continue your Grand Canyon road trip! You have a 1.5 hour drive to downtown Flagstaff where I recommend a pit stop for lunch, (we ate at the Flagstaff Brewing Company which was great). From here, you are about 30 miles away from your next destination of Devil’s Bridge. However, this drive is SO SCENIC you won’t even realize you are back in the car again. Heck I dare you NOT to pull over to take photos! You’ll drive through the town of Sedona and feel like you’re in a country western film, and don’t even get me started on the stunning red rocks surrounding you on all sides. If you have more time to spend, I’d recommend stopping in downtown Sedona and experiencing the magical Main Street or even check out Red Rock State Park. I’ve added it to my list of places to return to one day! Speaking of pit stops, don’t be embarrassed if you stop for jerky on the side of the road, all the cool kids do! Where the scenic drive ends, an even more scenic hike begins. The hike to Devil’s Bridge is quite a bit more difficult than the hike to Horseshoe Bend, so make sure you are physically prepared and have water with you. It’s about a mile walk from the parking lot to the trail head, and another mile to the archway, so plan for a 4 mile hike round trip. Don’t let the distance or your fear of heights scare you though, because it is SO worth it and photos do not do it justice! After the 2 mile hike from Devil’s Bridge back to your car, you have a 2 hour drive to Phoenix, where all good things must come to an end. Sunday Night: Red Eye Flight home from Phoenix! Time travel may not exist, but red eye flights are the next best thing! A midnight flight plus the time difference will get you home just in time to shower and head to work! However, if you don’t have to be back first thing Monday morning then consider spending the night in Phoenix. Either way, if you find you have time to kill before heading to the airport for your flight, check out Mother Bunch Brewery. It’s only 5 minutes from the airport and what better way to prepare for a flight than with a beer flight!? So tell me, what are your plans for this weekend? I hope you’ll consider a Grand Canyon road trip adventure! Not quite ready? Pin the itin for later! Thanks for the useful information and inspiration! Haha you have no idea, I took SO many pictures! Was too beautiful not too and yes definitely hard to choose which ones to post! I have been to Grand Canyon West Rim, from Las Vegas to West Rim in last Dec. Antelope Canyon is really awesome of rock formation. Just like a flower – totally another type of landscape. I guess I need to make another trip back to USA to check it out! Great write up by showing me how you do the road trip! It would be a good reference for me! What a great itinerary! I have been to Las Vegas and never made it to the Grand Canyon. I felt like I needed more time so I skipped it for next time but I see that it can be done in 48 hours1 How stunning are these rock formations. do you reckon its suitable for kids to do this itinerary? Yes! There were many families at the Grand Canyon and Antelope Canyon, and surprisingly we saw quite a few little kids doing the hike the Devil’s Bridge. I hope you’re able to visit one day too! Thanks so much! And yes, visit the US again, there are many beautiful places to visit. Ahh this post made me miss my trip here. We also visited the Grand Canyon, Antelope Canyon and the Horsehoe Bend two years ago. I’d love to see the Devil’s Bridge next time, thanks for your tip about being physically prepared and having enough water, I’ll definitely keep that in mind. What a dream southwest itinerary! IM dying to visit Antelope canyon and Horseshoe bend. Wonderful photos! It really was a dream! I hope that you are able to visit one day and experience Arizona yourself.